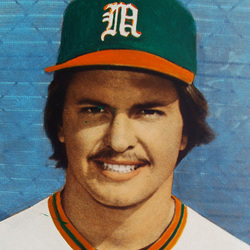 Popularly called "The Heater", Neal Heaton pitched from 1979 to 1981 and holds almost all of UM's pitching records, including most victories in a season (18), most victories in a career (42), most strikeouts in a game (23), most strikeouts in a season (172) and most strikeouts in a creer (381). In three years, Neal was twice named an All-American and in 1981 was selected by the Cleveland Indians in the draft. He made the big club after just one year in the minors. Heaton is the first Hurricane to be named to a major league all-star game. Neal was signed to pitch for the New York Yankees in 1993. His jersey #26 has been retired at Miami. Neal and his wife Laura reside in Long Island, NY and have two sons, Neal Jr. and Kurt.